Sushi! Waxy's Sushi Party is a fast-paced reflex-based arcade game in which players must simultaneously serve the orders flowing in from the customers while charging them for their food, tracking tips and deploying bonuses. Sushi! 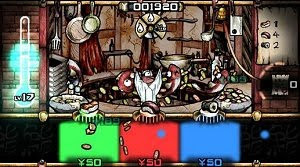 uses a unique colour-matching multi-tasking gameplay mechanic to simulate the experience of a hectic kitchen environment and the constant threat of being shouted at or fired on the spot.